This resource supports the use of the MathWorks 10 New Brunswick Edition Student Resource to deliver the learning outcomes of the Geometry, Measurement, and Finance 10 course. This CD includes the Teacher Resource in PDF format with hyperlinks, searchable text, and printable line masters. MathWorks 10 New Brunswick Edition is designed to meet the needs of students enrolled in the Geometry, Measurement, and Finance 10 course. 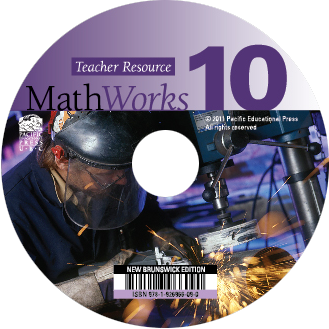 MathWorks 10 New Brunswick Edition addresses 100% of the learning outcomes described in curriculum. The Geometry, Measurement, and Finance 10 curriculum pathway was designed for students who may want to pursue post-secondary studies in trades, certified occupations, or direct entry into the workforce. Consequently, MathWorks 10 New Brunswick Edition was created to help students make a connection between what they learn in school and the real world of work. Each chapter contains many features designed to engage students, build their knowledge, and help them develop reasoning, visualization, communication, problem-solving, and critical thinking skills. Errata: The original printing of MathWorks 10 New Brunswick Edition contained the errors found in this document (PDF). We apologize for any inconvenience this may have caused. These errors will be corrected in future printings of the resources.